The organisers of the conference, Eritrea and the Ongoing Refugee Crisis, has published a new booklet: Eritrea: A Country Under the Sway of a Dictatorship. The publication provides a comprehensive overview of the situation in the country, the situation of Eritrean refugees in Europe and elsewhere, as well as introducing their initiatives and activities. During the 38th session of the Human Rights Council held in Geneva, International Fellowship of Reconciliation (IFOR) organized a side event, co-sponsored by War Resisters International, focusing on the causes of migration from Eritrea and the struggles of Eritrean refugees. Connection e.V., Förderverein PRO ASYL, Eritrean Law Society (ELS), Eritrean Movement for Democracy and Human Rights (EMDHR), Europe External Policy Advisors (EEPA), and War Resisters’ International have published a new booklet, Eritrea: A Country Under the Sway of a Dictatorship. The booklet provides a comprehensive overview of the situation in Eritrea, the situation of Eritrean refugees in Europe and elsewhere, as well as introducing their initiatives and activities. Overnight Eritreans begun repeating one name: Haj Musa Mohamed Nur, whether in support or opposition of him. He became a household name both at home and abroad after the Diaa Al Islam School uprising on the 31st October 2017. Today is Prisoners for Peace Day, when War Resisters' International and our members remember those imprisoned for their work for peace, and write to them in jail. Please join us! In Canada, a court in British Colombia has rejected an appeal by Nevsun Resources, a large Canadian mining company accused of relying on modern slavery at it’s Bisha Mine in Eritrea. There are “reasonable grounds to believe that crimes against humanity are taking place”, Sheila Keetharuth, UN Special Rapporteur on the human rights situation in Eritrea, has said. You're invited to "Eritrea and the Ongoing Refugee Crisis"
Militarisation in Eritrea is extreme, with indefinite conscription in often unbearable conditions. Conscientious objectors are imprisoned. Many people flee the country if they can, but if they arrive in Europe, they are not always given protection, and this month the European Court of Human Rights ruled that the Swiss government is not in breach of the European Convention by expelling an Eritrean asylum seeker. Published today: we're calling for the renewal of the mandate of the UN Special Rapporteur on Human Rights in Eritrea. We're glad to be amongst those working to keep the focus on the human rights situation in #Eritrea, where conscription is indefinite and militarisation "excessive" (according to Special Rapporteur Sheila B. Keetharuth). The letter was initiated by Civicus. 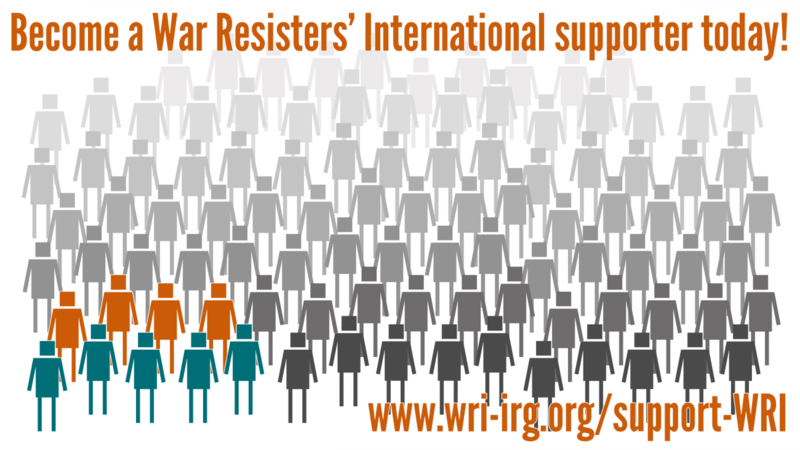 War Resisters' International maintains a unique resource, the World survey of conscription and conscientious objection to military service: a database of country profiles and information on the situation for COs and conscripts around the world. This is updated on a rolling basis, and we have recently revised our report on Greece. Military service, conscientious objection and related issues. HISTORY: Eritrea gained independence from Ethiopia in 1993, after a thirty-year armed liberation struggle, and that year became the 184th member state of the United Nations.1 Following independence, the Eritrean People's Liberation Front transformed itself into the “Popular Front for Democracy and Justice”, and under that title has imposed military rule ever since. Between 1998 and 2000 a war with Ethiopia over a disputed border caused massive casualties: since then there have been simmering border tensions but no full-scale military conflict. Nevertheless, the level of militarisation in the country has if anything increased. The United Nations has released a damning report into the operations of Canadian mining company Nevsun Resources in Eritrea, which accuses the company of using conscripted labour at it's Bisha Mine in the country. Nevsun estimated that the mine held over a billion pounds of copper and 2.7 billion pounds of zinc.